The store and Gothic Revival house at 1651 Morganston Road, have been an institution at the crossroads of Highway 25 and Morganston Road since the 1860s. operation. A vintage photo (see genealogy section) shows a short white picket fence and a fancy little gate in front of the house adjacent to today’s Highway 25, a small balcony accessed through the Palladium window-door no longer exists but is clearly shown in the photo. The store is narrow gauge clapboard, with a long sloping roof, reminiscent of the “Saltbox” style, and the vintage photo clearly shows the name J.A. Anderson Merchant on the awning. The store currently sells antiques but has had a number of identities over the years. There is a door between the two structures – it is attached rather than beside the house. There is a large barn with a steep sloping roof that is situated behind the store. It is in excellent condition and was probably built in the 1860s also. John Henry Reycraft owned this property from 1854 to 1899. The house was built during the period, probably in the 1860s. 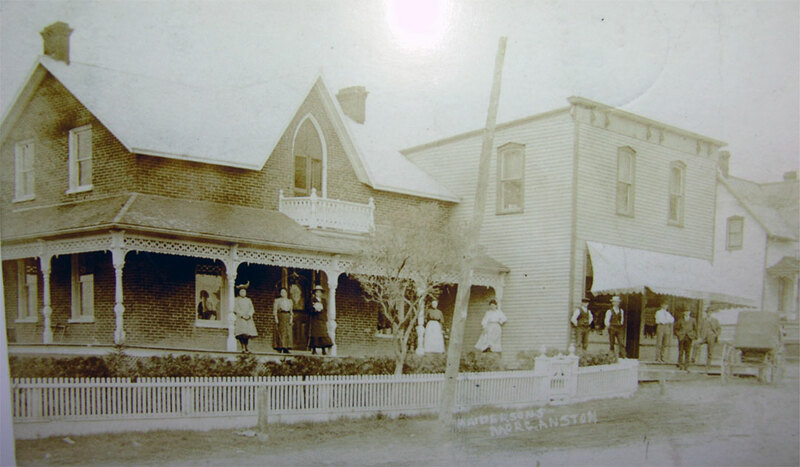 1899, John Alexander Anderson bought the house, at the time he was the proprietor of the general store built adjacent. Vintage photos show the house, the store and the absence of the Methodist church which was built in 1910. Fig. 1 (see genealogy section) shows a woman in Chinese garb, an intriguing image. It also appears that there is another building to the North of the store where Morganston Road is now. The original Crown land grant for Concession 8, Lot 17 was among the earliest in Cramahe Township, occurring on 14 December 1798 when land went to Phyllis Grant (1782-1857). In that year each of the members of the Executive Council of Upper Canada (the governing body under Lieutenant Governor Simcoe) received for their services land grants of 6000 acres for themselves and 1200 acres for each of their children. One of these Executive Councillors was Admiral Alexander Grant (1734-1813) of the Royal Navy, and Phyllis was one of his 11 daughters. By 1822 Phyllis had married Alexander Duff (1770-1809). She sold Lot 17 on 23 January of that year to Thomas Dickson (1776-1825) of Queenston, near Niagara Falls. Dickson was Phyllis’s brother-in-law, being married to her older sister Archange (1780-1829). By 1836 Thomas and Archange Dickson were dead and their only(?) daughter Mary Theresa Dickson (1814-1866) had moved to Britain. She married John Stewart Lyon (1808-1862) in London that year and the property in Cramahe Township was placed in trust for herself and her new husband on 18 November 1836. One of the trustees was her uncle Walter Dickson (1776-1855). Walter Dickson is listed in the Land Office record for this transaction as a “Writer to the Signet”. This is a Scottish term for a solicitor, the “signet” being originally the private seal of the Scottish Kings. The second trustee was Richard Mackenzie (1780-1850), Deputy Keeper of the Signet. The Keeper of the Signet was the senior office in the Society of Writers of Her Majesty’s Signet, an association of Scottish solicitors. This office was ceremonial, the administrative functions of the Society being under the charge of the Deputy Keeper. The third trustee was Thomas Bushby (1793-1865), a Commander in the Royal Navy. The fourth was named Isaac Bayley (?-?). The final trustee was George Lyon (1805-1879), John Lyon’s brother. Dickson, Bushby, Bayley, and Lyon sold the property to Hugh Bothwell (?-?) of Cramahe Township on 14 November 1844. No connection has been found between Bothwell and the previous owner. Bothwell sold the property to Gilbert McMicken (1813-1891) of Queenston on 28 July 1845. He was the brother-in-law of Ann Theresa Duff (1808-1887), daughter of Phyllis Grant, the original owner back in 1798. On 25 October 1848 Gilbert and Ann McMicken sold Lot 17 to Samuel Reddick (1824-1893) of Cramahe Township, a farmer married to Elizabeth H. Babcock (1824-1884, m. 1845). They had one son, Wellington (1850-1909), born in Cramahe. Samuel Reddick sold the eastern half of Lot 17 to John Brien (1809-?). Little has been found about Brien, other than that he was a resident of Cramahe Township and that his wife’s name was Mary. He soon (19 May 1854) sold his half of Lot 17 to John Henry Reycraft (1816-1901). Reycraft’s family consisted of wife Martha Jane Moore (1821-1891), and children Esther (1845-? ), Joseph (1847-? ), Eliza Jane (1848-? ), William John (1848-1941), Martha (1853-? ), and John George (1857-1927). On 17 September 1892 ownership passed into the hands of John Henry Reycraft’s youngest son John George Reycraft. His wife was Annie Beamish (1867-1893, m. 1883) and their children were Ethel May (1886-1927) and Ida Flora (1891-1973). John George Reycraft in turn sold the 100 acres in the eastern half of Lot 17 to John Alexander Anderson (1865-?) on 18 March 1899. 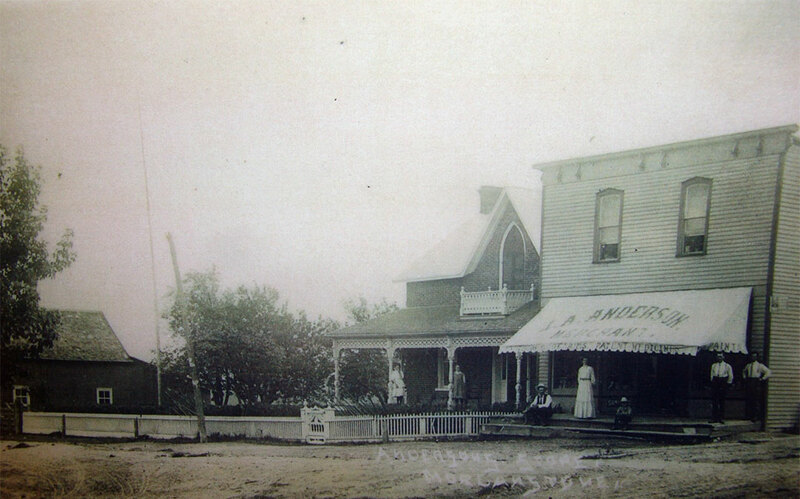 Anderson was the proprietor of the general store that was built adjacent to the house at about this time. His first wife was Emma Jane McColl (1870-1901, m. 1891) by whom he had five children: Mabel Gladys (1893-1980), James William (1895-1898), Harry Milton (ca. 1900-? ), Alta May (ca. 1900-? ), and Mildred Alice (ca. 1900-?). His second wife was Maud Mary Bailey (1878-?, m. 1904) by whom he had another three children: Jean Elizabeth (1908-? ), Margaret Beatrice (1910-? ), and Francis Mildred (1912-?). Vintage photographs of the house and store are provided in Figures 1 and 2. From the clothing that appears, these probably date from somewhere around 1900-1910. Figure 2 is definitely pre-1910 because the Methodist Church, built in that year, is absent from the background of the picture. An interesting aspect of Figure 1 is that the woman farthest to the left appears to be in Chinese garb (easier to see when the photo is enlarged). was the grandson of the brother of Daniel Massey (1798-1856), founder of what would become the Massey Ferguson Company, and great grandfather of Vincent Massey (1887-1968), the first Canadian- born Governor General of Canada, and Raymond Massey (1896-1983), famous Hollywood actor. This means that Marcus was the second cousin of the father of the famous Massey brothers. Property prices suggest that the house was likely constructed by the Reycrafts, who owned the property from 1854 to 1899. John Henry Reycraft bought the 100 acres in 1854 for £400 (equivalent at the time to $1600) and his son sold it in 1899 for $5500. The current occupant of the house thinks it dates to about the 1860’s, which certainly is reasonable. If so it was built by John Henry Reycraft.